Gilbane overcomes several project hurdles while saving schedule and cost. Gilbane implemented the Operable Unit 11 (OU-11) ROD, which included installation of 485 lf of piling in the storm water reservoir, 612,000 SF of fabric-formed concrete in the reservoir, and 10,623 lf of the OU-11 canal. 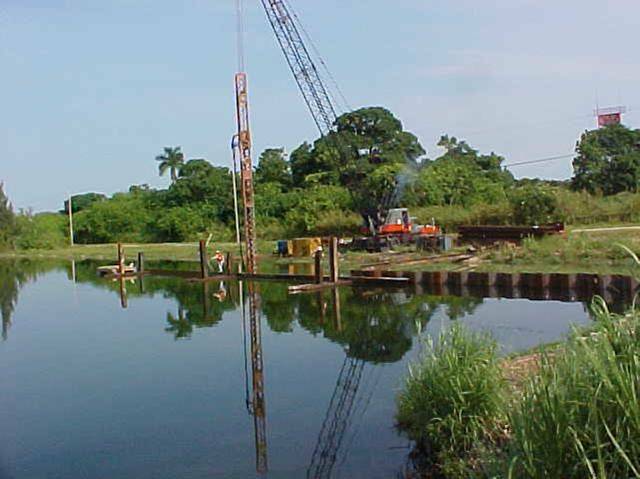 A 3-inch thick concrete liner prevented contaminated sediment transport through National Park property and into Biscayne Bay. Our team overcame limited access to work areas, the South Florida rainy season, and poisonous snakes, alligators and the endangered American crocodile. Despite these factors, we worked more than 25,000 hours without a safety incident and completed the work two weeks ahead of the deadline, saving schedule and cost. Gilbane is able to meet changing situations and assessments and quickly revise planning and designs when we find that documents do not match reality in the field or the regulatory boundaries within which we are working.